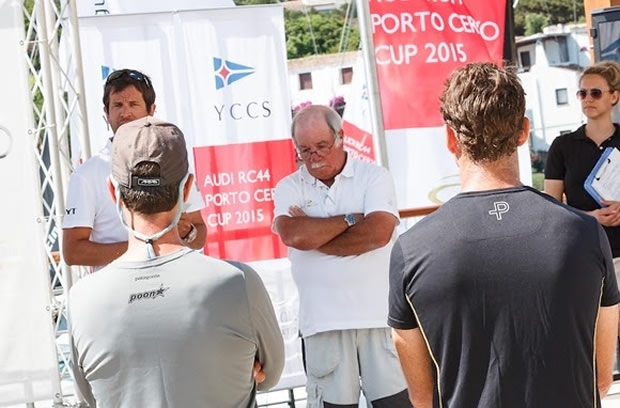 Porto Cervo: "Not normally like this here"
The conditions caused anxiety for Peter Reggio, one of the world’s most experienced Principal Racing Officers, and his race management team. “It was frustrating because it was teasing us the whole time – go, no go, go, no go, etc, but it is fine, that’s part of the deal,” he explained. “The velocity was up and down too much. It was sometimes 3.5 knots and the most we ever saw was seven at the top of the rigs, but it would come in for ten minutes and then it would go away and the direction was all over the place. We were having swings of 40-45° and when it finally went right to 070° towards the end, it started dying again. Today’s lack of wind brought the inevitable cries of ‘it’s not normally like this here’, but the owners in the RC44 Class are experienced enough to be prepared for this eventuality, participating in a sport that relies on Mother Nature’s co-operation. “It is what sailing is about,” said a resigned Igor Lah, skipper of Team CEEREF. Tomorrow the plan is to start racing at the normal scheduled time of 1200. Up to four races can be held per day. “That is probably what we’ll shoot for tomorrow,” said Reggio, as he arrived back in Porto Cervo late in the afternoon to the sound of flags cracking and the whistling of rigging as, inevitably, the new westerly wind filled in, too late. As to tomorrow’s conditions, Reggio says that local forecasts are looking more favourable.